The GiO Pressure Gauge provides a simple method for bedside pressure measurement in an easy to read digital display. There are no complicated buttons or display screens with the GiO. Start with two buttons and unlock the possibilities. 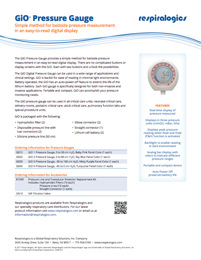 The GiO Digital Pressure Gauge can be used in a wide range of applications and clinical settings. GiO is backlit for ease of reading in minimal light environments. Battery operated; the GiO has an auto power off feature to extend the life of the lithium battery. Each GiO gauge is specifically designed for both non-invasive and invasive applications. Portable and compact, GiO can accomplish your pressure monitoring needs. 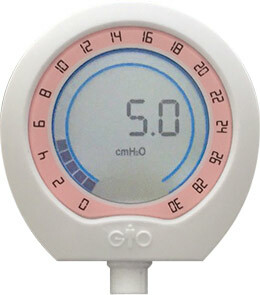 The GiO pressure gauge can be used in all critical care units; neonatal critical care, delivery rooms, pediatric critical care, adult critical care, pulmonary function labs and special procedure units. respiratory care distributors. For more information about our products, please email us at 4info@respiralogics.com. GiO is a trademark of GaleMed Corporation. Copyright © 2011-19 Global Respiratory Solutions, Inc.